I had this recipe for slow cooker baked beans in my stack of ” recipes to try” for quite some time and I finally got around to trying it. The results were amazing! You won’t believe what liquid is used to cook these beans in…. But first I have to share my new kitchen toy! Remember a few weeks back when I told you my slow cooker went wacky and was boiling everything to death? I asked for recommendations for your favorite slow cooker. 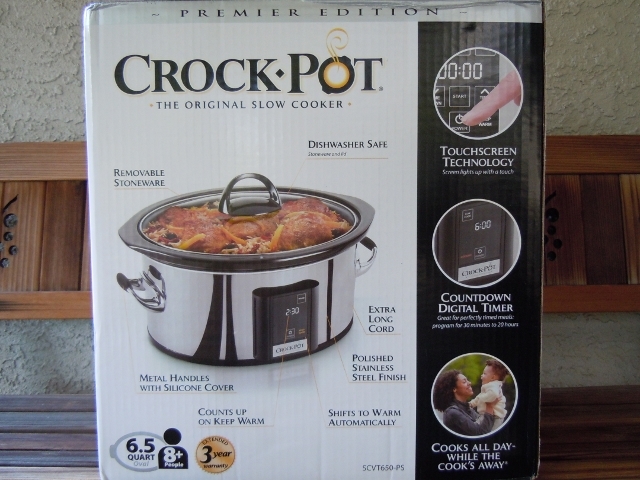 Sue responded and gave me the heads up that Cooks Illustrated rated the Premier Edition Crock Pot brand slow cooker, Model SCVT650-PS with Touchscreen as their top pick. It has a 3 year warranty and a 6.5 qt oval removable stoneware crock. I had a Macy’s gift card that I wanted to use and they didn’t stock this appliance in the local store so I ordered it from their website. Then I waited with great anticipation for UPS to arrive! Many days I heard the distinctive sound of the UPS truck coming down my street and driving right on by, until finally one day it stopped at my house! Don’t you just adore your UPS delivery person? It’s so much fun to get a package delivered to your door – especially when its a fun new toy to play with. Ha ha! It’s all shiny and new! I have only used it once but it will be getting a good work out in the months to come. None other than Carrot Juice! It sounds really strange but let me tell you that cooking the beans in the carrot juice (or using it in soups) causes something magical to happen. If you have a juicer you can make your own carrot juice but I don’t want to go to that much work so I buy carrot juice at Costco. It comes in a pack of three and I also use it in a lot of soup recipes instead of vegetable broth. Sam’s club here sells carrot juice as well as Trader Joe’s – in single bottles, health food stores, grocery stores and Whole Foods. It adds a ton of flavor not to mention all the nutrients it packs! The carrot juice offers a note of sweetness to the beans and they soak it all up as they cook – it also gives them this nice baked bean color. 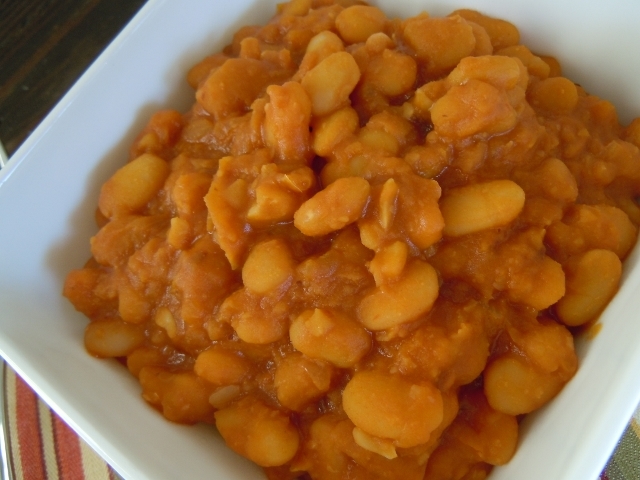 The beans were very tasty as is but I had to try and recreate one of my old favorite sugar laden, baked bean recipes for a chipotle baked beans and the results were fantastic. Slightly smoky – slightly sweet and down right delicious! Since the carrot juice added sweetness I didn’t need to add any other sweetener. Hubby Tom and I shared the last serving of these today. I will be making these again and again! I think they would freeze well but we didn’t have any leftover for the freezer. You just won’t know how amazing this recipe is until you try it at home! 1 chiptole pepper in adobo sauce, seeds removed, finely minced, plus 2-3 teaspoons adobo sauce depending on how hot you want it. If the chipotle peppers are large you might only want half of one. Refrigerate the leftover chipotle peppers to use for future recipes – or you can freeze them too. Or Use: Chipotle Chili Powder – start with just 1/4 teaspoon and adjust according to your personal preference. Combine dried beans, carrot juice water and onion in crock of slow cooker. Put the lid on and cook on high for 4-6 hours. 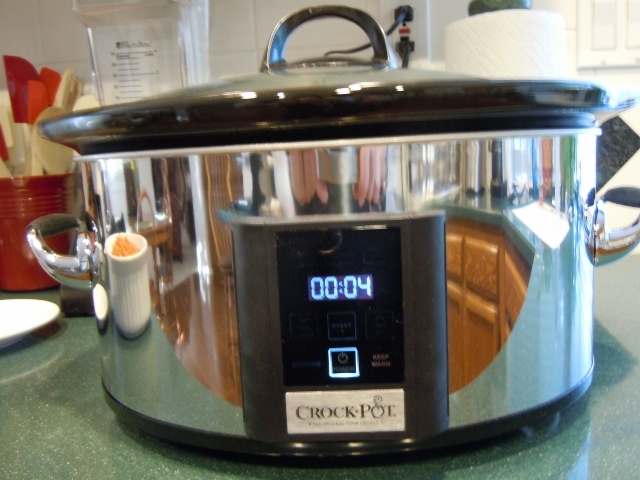 The time will vary from slow cooker to slow cooker – some run really hot and cook faster. During the last 30 minutes add tomato paste, vinegar, cumin, garlic powder and chipotle pepper. Notes: The beans taste delicious with just the first four ingredients, but during the last 30 minutes of cooking time the addition of the tomato paste and vinegar was suggested by the posters on the message board and it did add a nice baked bean flavor. However; I couldn’t stop there so I added cumin, garlic powder and chipotle pepper in adobo sauce and let it cook another 30 minutes for a total of 5 1/2 hours. Perfection! 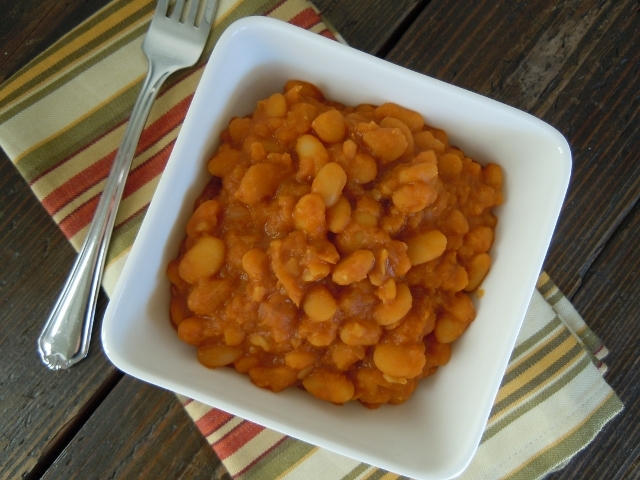 Recipe adapted from Barb’s Baked Beans – posted on the Dr Fuhrman message board. We finally got back out on the trail over the weekend. I will post about that in a separate post as this one was already getting too long! Do you have a favorite meatless slow cooker recipe? Feel Free to share a recipe link or email me the recipe. Glad you got out to hike! oh what a lovely new toy!!!! so pretty too. I gotta tell you, I am going to make this recipe as well. 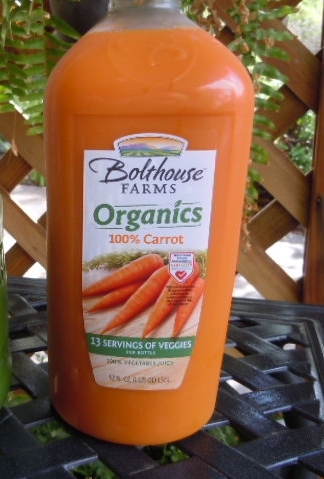 WE LOVE that bolthouse carrot juice in this house. It’s so freaking good! Sweet, but not too sweet. So I know those beans would be a hit. Pinning. What do you do with the carrot juice Renee? I am not a big fan of beans, although I do eat red beans and rice (which we made this week). John adores baked beans, though. Red beans and rice sounds delicious Lori! Wanted to let you know I made your winter vegetable soup this week….delicious. We had two days of rain here in Texas, and the soup hit the spot. I have to admit I don’t cook vegetarian often, but my high school daughter gave me the best compliment at the dinner table while eating the soup. She said my vegetarian dishes are so much better than what she hears some of her friends vegetarian parents serve. She said she wouldn’t enjoy a plate of plain beans with a side of vegetables. I’ll be trying more of your plant based recipes. Thanks for posting them all. Wow Sue that was a wonderful comment from your daughter! When you think about how much influence we have over our families healthy through the food we feed them it feels like a big responsibility! I am happy to be a part of your inspiration for making healthy vegetarian meals for your family. 🙂 Happy Cooking. I have been using my slow cooker a lot more lately to cook beans. This recipe sounds delicious! Thanks also for the carrot juice tip! I can see how it would add a nice sweetness to a lot of dishes! Gotta love UPS! Beans are so healthy and economical we are eating a lot of them these days! Hi Tami! These beans look great! Would you be able to convert to using the Instant Pot instead of the slow cooker? Always looking for more ways to use mine. I’m sure you could but I don’t have enough experience with the pressure cooker to tell you how. I would look up how long it takes to cook the beans in a PC cookbook chart and do that and then maybe add the other ingredients.If you try it let me know! Wow!! That looks delish!! I will totally try it!